Here’s what happens when you get a hundred or so passionate educators in a room: they get to work. 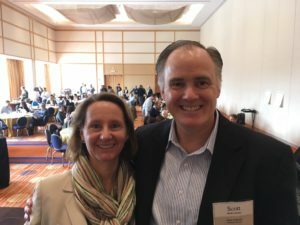 In a relatively non-descript ballroom of a Baltimore hotel, the inaugural meeting of the MTC burst out of the gates on Wednesday, March 1. The session started with a touch of ceremony as Founder and Board Chair, Scott Looney, welcomed the MTC’s 54 member schools – a number that grew after the morning session when 15 additional schools signed on. He then introduced Patricia Russell, the MTC’s interim executive director. And then we were off. The 100-plus participants in the room ran the gamut of a school’s org chart – heads, faculty, department heads, division directors, college counselors. The rule was that each member of the MTC had to sit with strangers because the point of this Consortium is to become more than the sum of our parts. No one balked. While the Mastery Transcript isn’t built yet, we do know that it will include Mastery Credits that teachers and administrators will distribute to students who apply and submit evidence. The first task for the groups was to think through what that process would actually look like. The exercise asked them to choose a Mastery Credit within “Leadership and Teamwork” and describe the forms of evidence that students would have to offer in order to earn that credit. Tables got right to work and brainstormed the kinds of expressions of leadership and teamwork that would likely appear in the student’s petition for credit. Things got complicated as they began to wrestle with how to distinguish among potential kinds of evidence. What would attributes of mastery look like? 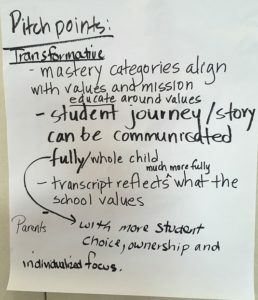 After groups grappled with this first task, they were then asked to consider a statement and respond to it: “Adopting Mastery Credits and an evidence-based transcript will have minimal impact on classroom instruction.” Groups had to discuss whether they agreed, strongly agreed, disagreed or strongly disagreed with this proposition. It’s an obvious and important question:“How long will it take before a mastery transcript is ready for launch?” Before any school is ready to offer Mastery Credits, there are logical steps they will need to take, steps that include moments of reflection and revision. At their tables, the members of the MTC began to scope out what would have to be in place before a transcript would be ready. Some steps were procedural while others focused on communication and cultural questions. 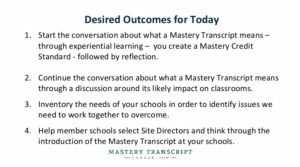 The success of the Mastery Transcript will undoubtedly rely heavily on each school’s site director. These school leaders will be the primary liaisons between the school and the MTC. They will coordinate communications, lead the school-based MTC team, explain the shared language and context around competencies, and work with the school’s leadership around Mastery Credits. Knowing just how significant a role this will be, each table worked through some essential questions about what schools and site directors will need in order for this process to be successful. The results of all this work are still on the oversized Post-It notes littered around Patricia Russell’s office. She’s going about the process of transcribing and synthesizing the feedback. In the meantime, the main take away is that the work of the MTC will be messy and invigorating. Terry Dubow is the MTC's Director of Communications while also working in a variety of academic and administrative roles at Hawken School in Gates Mills, OH. 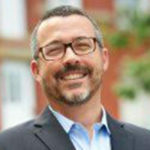 He has previously served as the Associate Head of School at Westtown School and the Director of Strategic Projects at Hathaway Brown. He's been an English teacher for nearly 25 years and is excited to help tell the story of the MTC.